Will it rain or not? The best way to answer this question is by looking at the clouds. Chances of rain is ascertained when the sky has cumulonimbus clouds. Let's take a closer look at this type of cloud. Cumulonimbus clouds are characterized by their huge, fluffy formations straddling across extensive atmospheric levels. These towering cloud structures carry a large mass of moisture that produces intense weather conditions such as heavy rainfall, lightning, snow, hail storm and even tornadoes. Cumulonimbus cloud is named after two Latin words, cumulo which means puffy and nimbus which denotes rain. At What Height is Cumulonimbus Clouds Found? Cumulonimbus cloud is a vertical developing cloud whose base may sit from 10,000 to 20,000 feet above the Earth’s surface and grows up to 75,000 feet from the ground. This is the reason why the cumulonimbus cloud is called the towering cloud. The base of a cumulonimbus cloud is largely made up of water droplets, while ice crystals dominate the summit. Strong convection updrafts encourage the cumulonimbus cloud to grow at higher elevations and develop an anvil-shaped cloud upon reaching equilibrium level, the time when the surrounding air is warmer than the updraft. Cumulonimbus clouds develop when there is strong atmospheric instability enhanced by turbulence or convection due to an advancing frontal weather system. This forms when the rising, warm air reaches the atmospheric level where the surrounding air is warmer causing it to flatten like an anvil shape. When an anvil cloud is formed alongside a cumulonimbus cloud, it is a strong indication that the cumulonimbus cloud is already mature signaling severe weather condition. How Does a Cumulonimbus Cloud Look Like? Cumulonimbus clouds appear like huge and immense cumulus clouds. They have dark and ragged bases with soft, fibrous summits due to their ice crystal composition. Once it is mature, the summit of a cumulonimbus cloud will take the form an anvil making it look like a huge mushroom. Cumulonimbus clouds may come in different forms and shapes. Let us consider them closely. This type of cumulonimbus cloud has an overpowering smooth form which resembles a bald head. Cumulonimbus calvus develops next to a congestus cloud and brings heavy rain but rarely triggers hail or lightning. This cloud formation is characterized by ragged or streaky summit. Capillatus can develop from 2,000 feet from the ground and extend as high as 60,000 feet. Cumulonimbus Capillatus can bring about tornadoes. The cumulonimbus Incus cloud has an anvil-shaped summit due to convection and unstable air at the cloud level. It is often referred to as the “thunderhead” because it is a strong sign of a fully-developed thunderstorm. 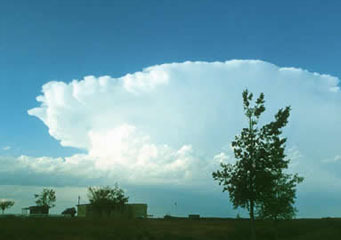 A cloud formation that exhibits a sac-like projection at the base of the cumulonimbus cloud, the Cumulonimbus Mamma is produced by a strong convection and reverse-direction convection. Cumulonimbus mamma brings severe turbulence at the cloud level, lightning, hail and tornadoes. Cumulonimbus pileus has distinctive cap cloud formations at the summit. Extreme convection lifting followed by absorption of air layer fuels its formation. This cloud structure helps weather forecasters predict thunderstorms. Other forms of cumulonimbus clouds are cumulonimbus virga, cumulonimbus praecipitatio, cumulonimbus arcus, cumulonimbus tuba, cumulonimbus velum and cumulonimbus pannus. How common are Cumulonimbus Clouds? Cumulonimbus clouds are common worldwide except in the Antarctica region. This cloud formation commonly develops in the afternoons of summer and spring months when the Earth’s surface is heated up. Oftentimes, you will see them along gust front lines. The next time you see cumulonimbus clouds, you now know that a thunderstorm is nearby.